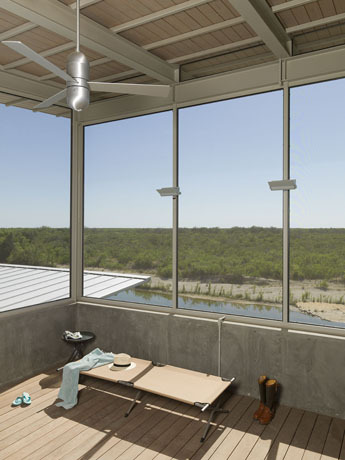 One of the client's cherished possessions is a vintage streamlined aluminum house (not travel) trailer, and he wanted to relocate the trailer to the family's favorite spot on their South Texas ranch overlooking the Nueces River. Given the fragile geology and the flash-flood prone nature of the riverside location, the trailer's foundation and protection required special considerations. The resulting solution is a steel-framed, metal-roofed cradle, right at home amongst the existing rain barns and ranch equipment sheds. The cradle lifts the trailer above the flood plain and provides accessory components, sweeping river views, and safe access to the fishing/swimming hole. The cradle is anchored by a concrete blockhouse containing utilities, storage, and bathroom and topped by a screened sleeping loft. Rainwater harvesting is SOP in South Texas. The trailer interior is refurbished with bamboo panels. Interior lighting is provided by LED cove & mini-spots. The Ipe and Douglas Fir decking is FSC certified.